Muhammad Khan is an engineer, a secondary-school maths teacher, and a YA author. He takes his inspiration from the children he teaches, as well as his own upbringing as a British-born Pakistani. He lives in South London and is studying for an MA in Creative Writing at St Mary's. His critically acclaimed first novel, I Am Thunder, was published by Macmillan Children's Books in 2018. 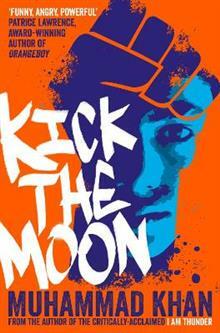 Kick the Moon is Muhammad's second novel.